A non-blocking RF switch matrix is more complex than the blocking type, but it’s also more flexible. In this configuration, an input can be switched to multiple outputs. One input can in fact be switched to all of the outputs at once. This provides an extra degree of flexibility compared to the blocking architecture. However, a non-blocking architecture still has the limitation of not allowing two or more inputs to be switched to the same output. Input 1 for example can be simultaneously switched to every output or selectively switched to several outputs at once, but no other input can be switched to any of the same outputs. This architecture is accomplished by a 1 x N splitter at each input, a set of N x 1 output switches and interconnects between the splitters and switches. 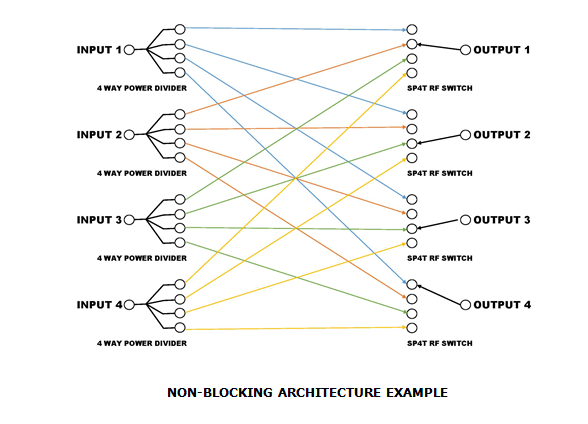 The added capability of the non-blocking switch matrix in distributing signals has a down side. Because splitter isolation is generally not as good as switch isolation, non-blocking matrices often have lower isolation. Also, since the signal is being split N ways, a non-blocking matrix generally has higher insertion loss as well. Isolation and insertion loss can be improved by adding complexity. For example, adding amplifiers can make up for any internal losses. Output 1. Input 3 is switched to both Output 2 and Output 3. There are no other available outputs for Input 3 unless at least one connection path is removed. In general, an RF switch matrix distributes multiple RF input signals to multiple outputs. This is most widely used in a production test or lab environment to switch various signal generators, spectrum analyzers, network analyzers, power meters, modulators and the like into or out of test products. Other uses are switching banks of transmitters and receivers to multiple antennas or distributing video channels around a CATV Head End. 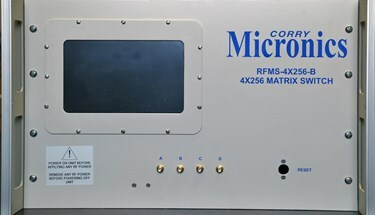 These systems are designed to eliminate the need to manually connect and reconnect different RF paths, saving on labor, reducing human error and preserving consistency. For information on their features and specifications, download the datasheet. 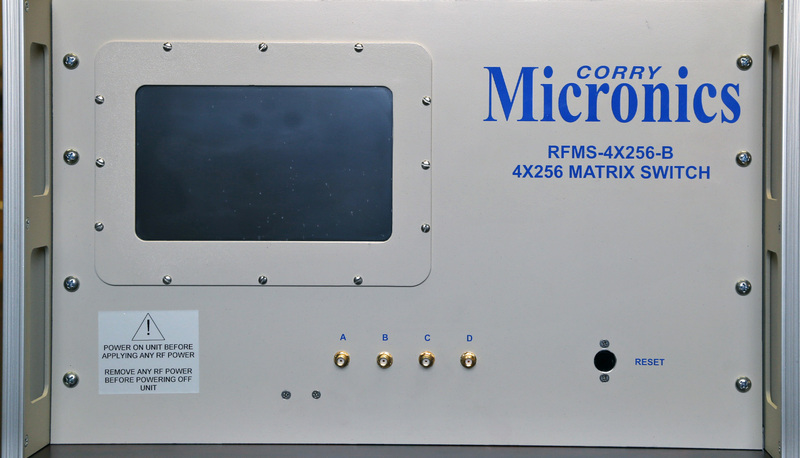 You can also contact Corry Micronics to speak with their VP of engineering to discuss your specific application.